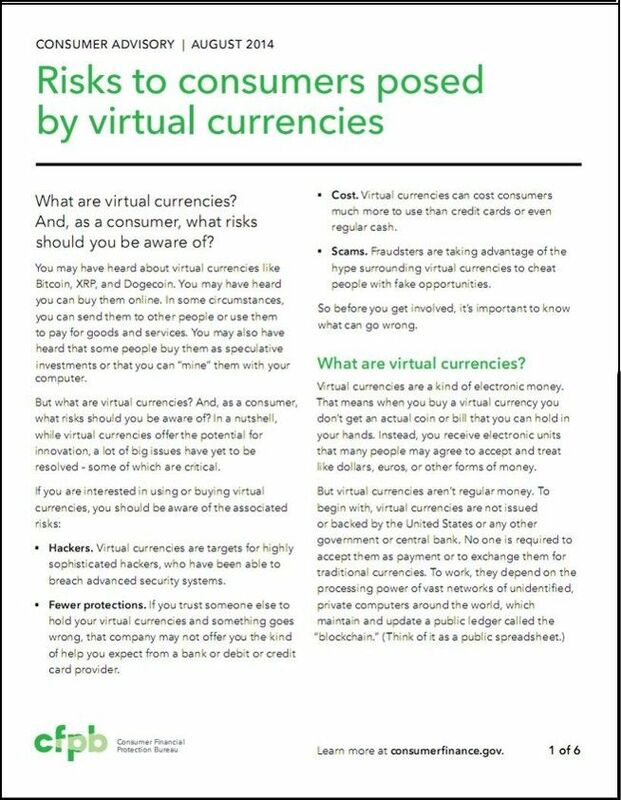 WASHINGTON, D.C. — Today the Consumer Financial Protection Bureau (CFPB) issued a consumer advisory warning consumers about the risks of virtual currencies such as Bitcoin. 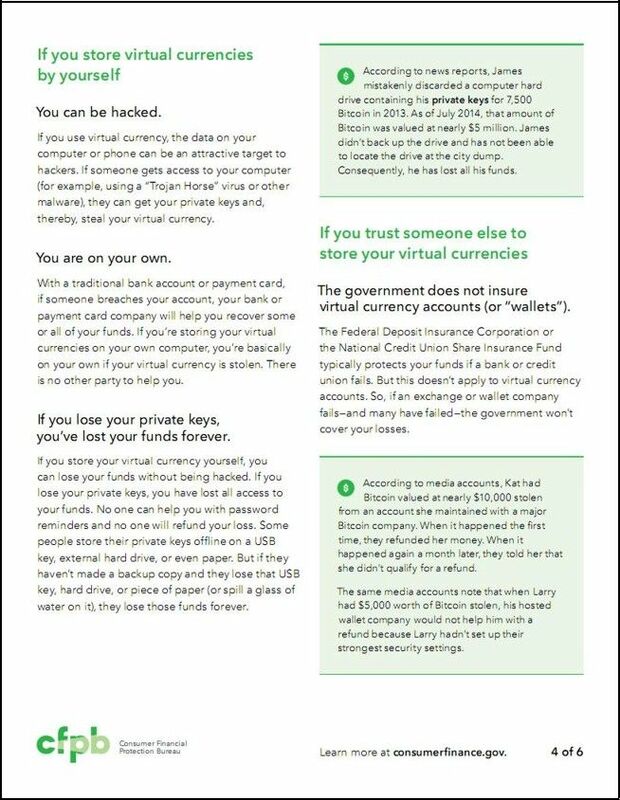 The CFPB advises consumers to be aware of potential issues with virtual currencies such as unclear costs, volatile exchange rates, the threat of hacking and scams, and that companies may not offer help or refunds for lost or stolen funds. The CFPB also announced that consumers who encounter a problem with a virtual currency product or service can now submit a complaint with the Bureau. Virtual currencies are designed to be an alternative to current payment systems. Better-known virtual currencies include Bitcoin, XRP, and Dogecoin. Often referred to in the industry as “digital currencies,” they are a way for people to track, store, and send payments over the Internet, and they may have the potential to make payment processing cheaper or faster. But they are not backed by any government or central bank. In addition, because virtual currency accounts are not insured by the Federal Deposit Insurance Corporation or the National Credit Union Share Insurance Fund, if a virtual currency company fails – and many have – the government will not cover the loss. Virtual currency companies are springing up around the world to offer products and services to consumers. There are virtual currency exchanges, which are companies that help consumers buy or sell virtual currencies. There are also online “digital wallet providers,” which are companies that allow consumers to create accounts with them to store and manage their virtual currencies. Many virtual currency exchanges are also wallet providers, and vice versa. Exchange rates are volatile and costs unclear: The exchange rate of Bitcoins to U.S. dollars in 2013 fell as much as 61 percent in a single day. In 2014, the value of Bitcoins has dropped by as much as 80 percent in a single day. 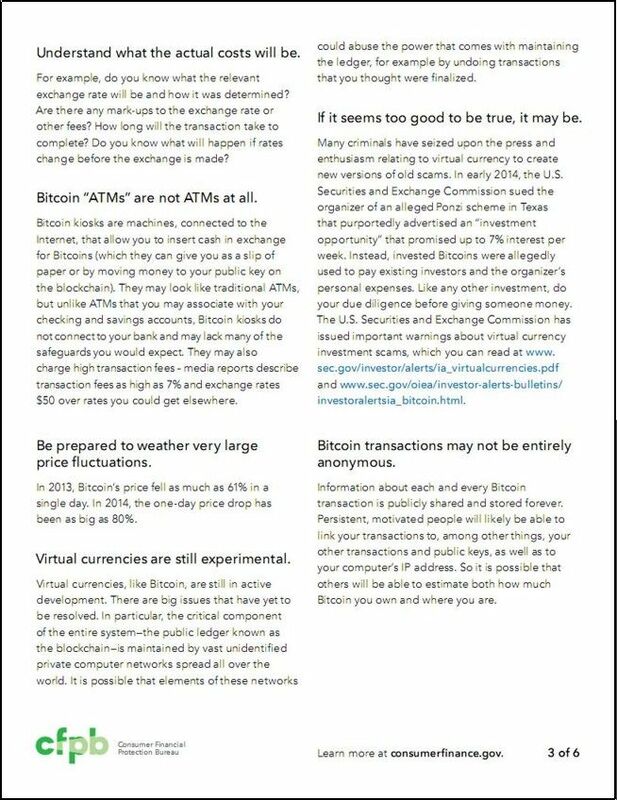 The advisory explains that consumers who buy virtual currencies should be prepared to weather this kind of volatility. Consumers should also consider whether there are mark-ups or other fees when using an exchange or digital wallet provider. Companies may be charging consumers to buy, spend, or accept virtual currencies. Hackers and scammers pose serious security threats: Virtual currencies are targets for highly sophisticated hackers and scammers. 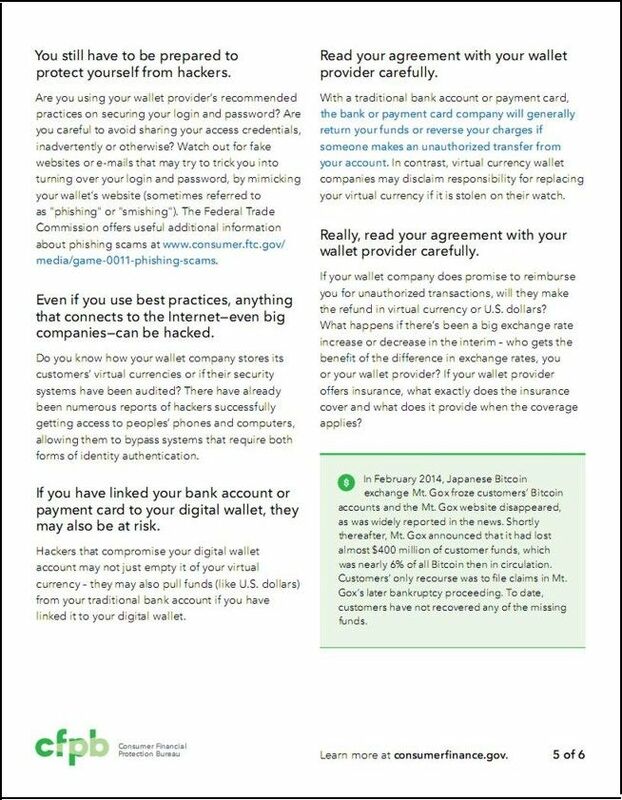 Individuals, digital wallet providers, and exchanges are all at risk. For example, if a hacker gains access to a consumer’s Bitcoin “private keys,” which are 64-character codes that unlock the consumer’s funds, the consumer can lose all their virtual currency. Fraudsters are also taking advantage of the hype surrounding virtual currencies to pose as Bitcoin exchanges, Bitcoin intermediaries, and Bitcoin traders in an effort to lure consumers to send money, which is then stolen. 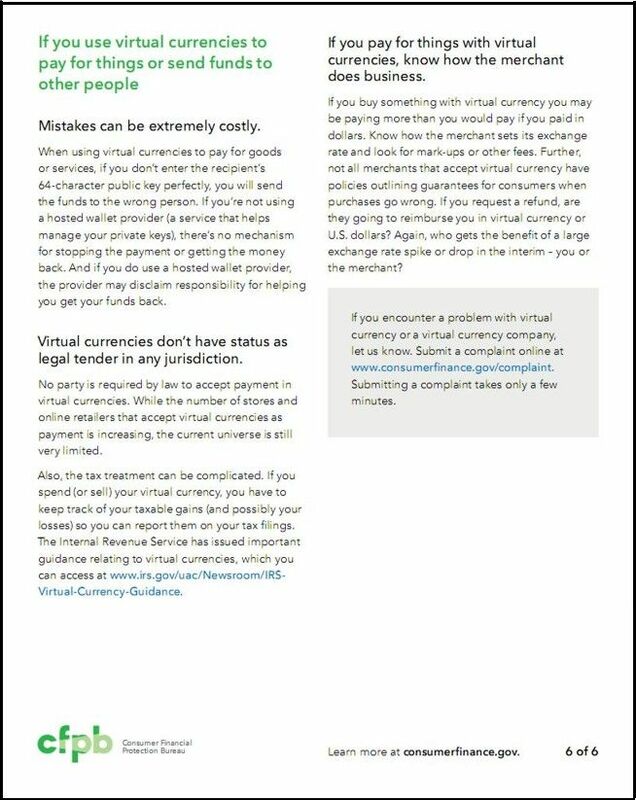 Companies may not offer help or refunds for lost or stolen funds: Some virtual currency companies do not identify their owners, provide phone numbers and addresses, or even specify the country in which they are located. Before using a company’s products or services, consumers should carefully consider if they know how to contact the company in question, and if they know their contractual rights. If a consumer trusts a company to hold their virtual currencies and something goes wrong, the company may not offer the kind of help the consumer would expect from a bank, debit card, or credit card provider. In fact, some virtual currency companies disclaim responsibility for consumer losses if funds are lost or stolen. Consumers who encounter a problem with virtual currency products and services – including exchange services or online digital wallets − can now submit a complaint with the CFPB. The CFPB will send the complaint to the appropriate company, and will work to get a response. If the complaint is about an issue outside the CFPB’s jurisdiction, the CFPB will forward the complaint to the appropriate federal or state regulator. 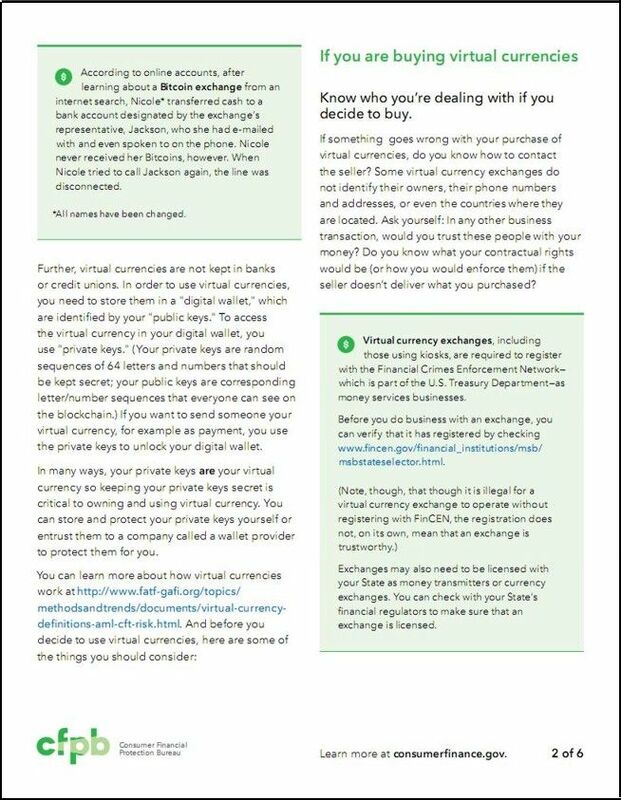 Importantly, the CFPB will use all complaints to better understand the virtual currency market and its effect on consumers. The CFPB will also use the complaints to help enforce federal consumer financial laws and, if appropriate, take consumer protection policy steps. Pooling only makes it worse for the individual, who needs to contribute to the profit of the organizer and software owner / supplier as well as relying on the other members of the pool contributing equally.